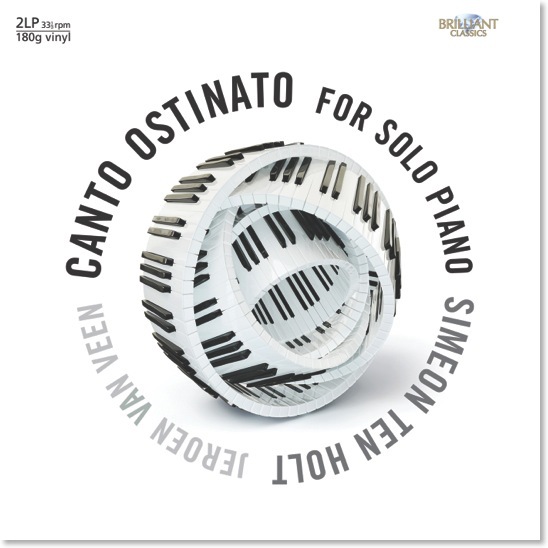 A double LP of a solo piano version of Canto Ostinato, by Simeon ten Holt. Canto Ostinato is an iconic work, one of the masterpieces of Minimal Music, consisting of 100 cells or patterns, which are shifting constantly if slightly upon the decision of the performer(s). Jeroen van Veen has a special affinity for this work, having worked on it with the composer. He presents an authoratative interpretation, enhanced by that special analogue sound of vinyl… 180 grams audiophile Vinyl, 33 ⅓ rpm. Simeon ten Holt, who recently passed away at the age of 89, was one of Holland’s foremost 20th century composers. Throughout his exceptional career, he turned his hand to Serialism, neo‐Classicism and many other modern forms of classical music. He remains best known, however, for his Canto Ostinato: an extraordinary work formed of over 100 sections, which is remarkable for the fact that all performance decisions are left up to the interpreters. Even the instrumentation can change; past performances have included versions for four pianos, two pianos, two marimbas and many more. The version on this release is for solo piano. The dynamics, tempo and timbre are also left to the performer, meaning that no two performances are ever the same, and this new interpretation by Dutch pianist and composer Jeroen van Veen will certainly make its mark. Canto Ostinato has become not only the Ten Holt’s best‐known work but also his most performed piece, both inside and outside of his home country. Jeroen van Veen is the perfect choice to interpret Ten Holt’s masterpiece. Co‐founder and president of the Simeon ten Holt Foundation, he has long held an interest in the composer’s works, and is regularly invited to perform his music around the world, often accompanied by his wife, pianist Sandra van Veen. Van Veen is particularly passionate about Minimalist music, and his extensive repertoire includes releases of Glass, Pärt and Einaudi, all of whom form a part of the modern Minimalist tradition established by Ten Holt and his contemporaries. This recording is part of a new line of vinyl releases that Brilliant Classics is proud to offer. Encapsulating the best of modern classical music, these LPs are perfect for all listeners, whether connoisseurs of Minimalist music or those simply looking to relax.